Farmadeliphication (fahr’muh’deli’fi’kay’shun), n. 1. 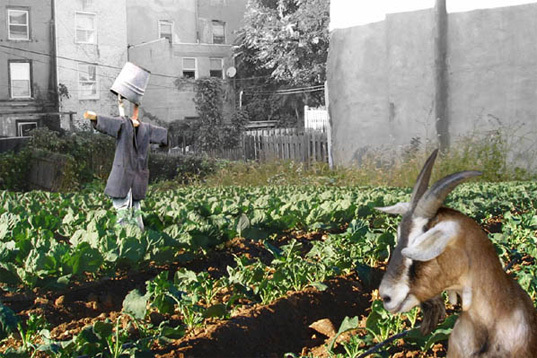 The process of turning all of Philadelphia’s vacant and abandoned lots into urban farms: The ‘Farmadeliphication’ of once decrepit buildings into farm structures advances fresh ways of seeing old structures as well as allowing for an organic transformation of history that contributes to the present day fabric. 2. What might happen if the Front Studio team’s entry to the Urban Voids competition moves beyond the conceptual stage. Farmadelphia proposes a break down of the divisions between ecology and the built environment – a pretty standard mission among urban revitalization advocates these days. But Front’s vision doesn’t merely sprinkle a community garden here and there; they want to Farmadelphify the whole city. 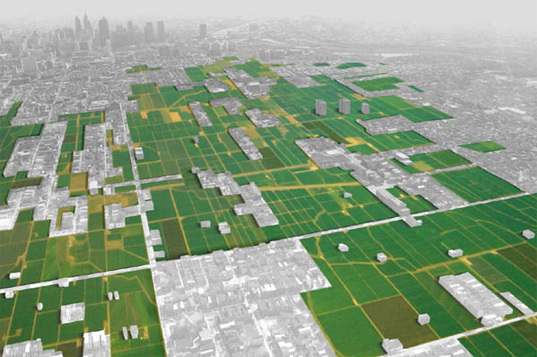 In this scenario, vacant lots around Philadelphia would be converted into agricultural plots, and the abandoned buildings that occupy many of those sites would stay put, only they’d become useful again in the context of the farm. As a community renewal effort, Farmadelphia would bring people together around both the labor and the rewards of having productive crops growing in the neighborhood. The farms would establish employment opportunities and encourage entrepreneurship among citizens who might want to sell their harvest to groceries or restaurants. Of course, this would also increase the availability and affordability of fresh, local produce all over the city – what’s better than gathering your own greens at dinner time or picking an apple on the way home? 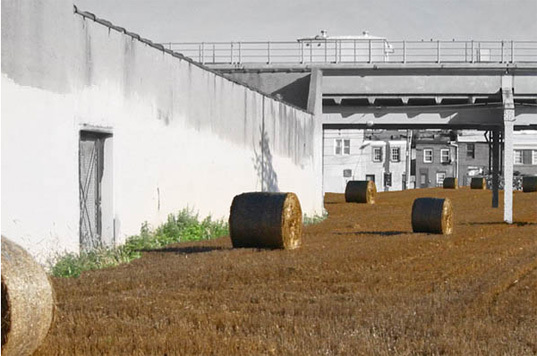 Urban Voids: Grounds for a Change emerged as an international call for design ideas from Philadelphia’s LandVisions community meetings. The competition invites proposals for a long-term strategy that envisions how vacancy in Philadephia can be changed from an obstacle (vacancy as absence) to an asset (vacancy as possibility)…Design proposals should address the issue of vacancy at a citywide scale, referencing Philadelphia’s waterways, soils, and geology, as well as the city’s physical adjacencies. Lots could include former industrial (“brownfield“) sites – so entries should acknowledge issues of toxicity and urban waste – as well as sites that have been treated transitionally through cleaning and greening.